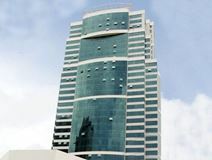 Office space to let in a sophisticated business centre in Salvador. The centre has an administrative support area, featuring the latest equipment an auditorium and an internet café. Security is assured and the building's technological infrastructure is state of the art. The centre is ideally located, with easy access to both domestic and international airports, and a range of fantastic amenities in the immediate area. The impressive views, crisp modern design, inspiring architecture and idyllic surroundings are sure to benefit any company or client's business image. Set in one of the liveliest quarters of this thriving and attractive city, this center offers a range of highly effective serviced office solutions for working professionals and those in need of larger corporate requirements. With exquisite furnishings, high end technical facilities and equipment, this is the perfect business setting for all.